There have been a few inquiries about the ALC Policies and Procedures. So here is a copy for your reference. 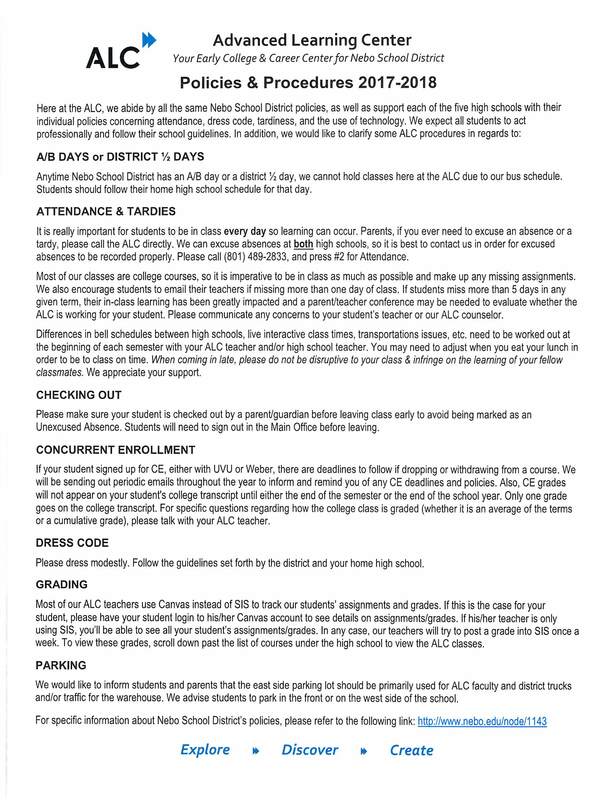 A/B DAYS or DISTRICT ½ DAYS Anytime Nebo School District has an A/B day or a district ½ day, we cannot hold classes here at the ALC due to our bus schedule. Students should follow their home high school schedule for that day. CHECKING OUT Please make sure your student is checked out by a parent/guardian before leaving class early to avoid being marked as an Unexcused Absence. Students will need to sign out in the Main Office before leaving. CONCURRENT ENROLLMENT If your student signed up for CE, either with UVU or Weber, there are deadlines to follow if dropping or withdrawing from a course. We will be sending out periodic emails throughout the year to inform and remind you of any CE deadlines and policies. Also, CE grades will not appear on your student's college transcript until either the end of the semester or the end of the school year. Only one grade goes on the college transcript. For specific questions regarding how the college class is graded (whether it is an average of the terms or a cumulative grade), please talk with your ALC teacher. DRESS CODE Please dress modestly. Follow the guidelines set forth by the district and your home high school. GRADING Most of our ALC teachers use Canvas instead of SIS to track our students’ assignments and grades. If this is the case for your student, please have your student login to his/her Canvas account to see details on assignments/grades. If his/her teacher is only using SIS, you’ll be able to see all your student’s assignments/grades. In any case, our teachers will try to post a grade into SIS once a week. To view these grades, scroll down past the list of courses under the high school to view the ALC classes. PARKING We would like to inform students and parents that the east side parking lot should be primarily used for ALC faculty and district trucks and/or traffic for the warehouse. We advise students to park in the front or on the west side of the school. PARKING We would like to inform students and parents that the east side parking lot should be primarily used for ALC faculty and district trucks and/or traffic for the warehouse. We advise students to park in the front or on the west side of the school.